Built in 1979 by PCC Motor Bodies in Newton Abbott and commissioned for Devon Fire Brigade by their own workshops in the same year. All Devon Dennis D series were de-commissioned in 1995 and 14 of the batch were donated to Romania as an aid package. 2 were broken for spares and 2 remained in the UK, SJY 845T being one of them. At this time, the original body builders, PCC Motor Bodies, purchased this appliance from Devon Fire Brigade and displayed it in their works then later in a Plymouth museum. The museum closed in 2005, PCC had no space so SJY 845T was purchased by father and son collectors in Hampshire. In June 2005, the pair purchased a sister appliance of this and lack of space brought the opportunity for the current owner. 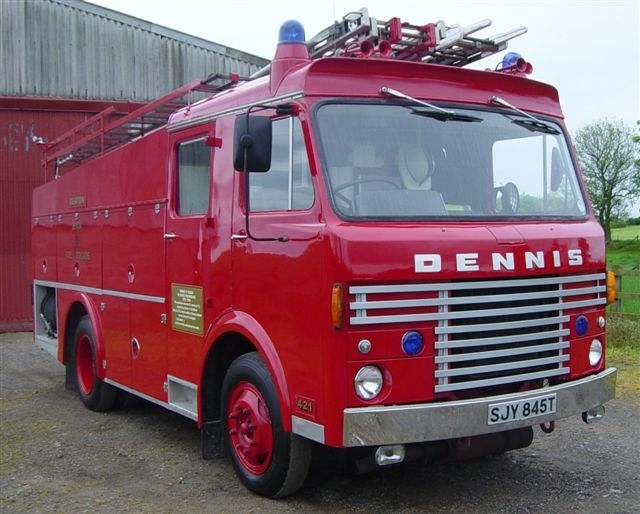 Some UK fire brigade(s) still use this Dennis as their 2nd turnout. Added by Bomba Boy on 28 December 2006. Bomba Boy, no Dennis D series have been in frontline UK fire services for some years now. Added by on 06 January 2007. Pcc motor bodies Newton abbot never built fire appliances they were however the major bodywork repairer for devon fire and rescue service. This appliance is a dennis thoroughbred being built in guildford. It was the last dennis d to be withdrawn from service in devon and the only one to have its original bosch beacons(as fitted in this photo)replaced in service with strobe type as fitted to the rs appliances that replaced the 'd' appliances. Added by Graham Hart on 09 January 2007. I love these old Dennis Ds, reminds me of my childhood & seeing them go out on shouts in Brixham. Proper looking appliances with decent sirens on them, the old 2 tones!! Do you know the registrations of the ones that were in Brixham & whether they were amongst the ones donated to Romania, kept in the UK or were they amongst the ones broken up upon being decommisioned. Added by Neil Armstrong on 08 March 2008. Extremely good point raised by Neil - I had been going to ask if anyone knew the registration numbers of those that were donated to Romania too ! Added by Ian Moore on 09 March 2008. Added by Neil Armstrong on 09 March 2008. After serving at Exeter as 321A TTT 569R was transferred to Tiverton as 442 replacing HCB Angus Bedford TK. STA 303H a water tender that was converted to a multi purpose appliance by the workshop staff at stn 32. its call sign was 441A. TTT 569R partnered LTT 209P 441 until they were replaced by Dennis RSs A666 KFJ and A667 KFJ. Whilst at Tiverton LTT 209P suffered a major accident and the cab was rebuilt by Sidwell Street Motors.After being replaced at Tiverton this appliance ended up in a childrens playground at the Hare and Hounds public house near Honiton. Added by Dave Roberts on 31 July 2008. Added by Neil Armstrong on 31 July 2008.
appliance went out of service in 1992 having spent all its working life at that station and then went into presevation.I have a picture of her in presevation taken back in the 90's, but wondered whether she might still be around today?. Added by Pete Matten on 01 August 2008. Added by Barrie Green on 01 August 2008. Added by Neil Armstrong on 01 August 2008. Barry the boat yard along the Weaver in Northwich any chance? As I seen one there in March but didn't go over for a picture. Added by Andrew Wright. on 01 August 2008. Added by Barrie Green on 02 August 2008. There is a picture of the Ford on here I'm sure I posted it. Added by Andrew Wright. on 02 August 2008. Added by Mark McMullen on 02 August 2008. Sorry.I should have looked through the site before I mentioned about XTT 310.It was actually at the Odiham Show this very weekend.Still looking really good. Added by Pete Matten on 03 August 2008.
hello Mark !!!! . have you replaced your headlining material in your cab yet ? having trouble finding some replacement !. Taking yours out again this year ???. Added by Jmp on 24 August 2008. Do you know where TTT570R served? It's just turned up on ebay converted into a mobile home! Added by Neil Armstrong on 14 July 2009. Found another, LTT210P, later used by travellers converted into a breakdown truck & was last on the road in 1993. Anyone know where this one served? Added by Neil Armstrong on 24 July 2009. To Ian Moore: Do you know how many of these ex Devon appliances were sent to Romania? Hi Does anyone here know the history of LTT213P? Added by Andy on 12 September 2009. Added by Neil Armstrong on 12 September 2009. Thank you for the served location of LTT213P are any of you interested to know where it is now or do you already know? Added by Andy on 13 September 2009. Added by Neil Armstrong on 13 September 2009. LTT 210P served at Bovey Tracey. It featured in a Dennis brochure with the equipment it carried laid out in front of it. The whole Multi Purpose concept was originally developed by Plymouth City Fire Brigade and adopted by Devon on its formation in 1974. Added by Andy Fish on 02 July 2012. Added by Fatjon Daka on 03 July 2014. Fatjon.....can you confirm which machine is in Lushnje and what is going to happen to it know its retired (for the second time) please. Added by Barrie Green on 06 July 2014. Added by Ian Land on 25 November 2014. Added by Tony on 27 January 2017. I had the pleasure of driving this appliance at Seaton. Added by Jurgen Jameson on 14 November 2018. What made them "multi purpose"? Added by Rob Johnson on 17 November 2018. Rob, These appliances, originally developed by Plymouth City Fire Brigade as I mentioned in my previous post were the fore runners of today's pumping appliances. Equipment carried included extrication equipment, all be it quite primitive by today's standards, foam making equipment and enhanced firefighting gear compared to what was carried on typical pumps/ pump ladders of the early 70's. Many of the Multi Purpose based pumps were still in service when I joined the then Devon Fire Brigade in 1986 and I cut my teeth so to speak on them. Added by Andy Fish on 21 November 2018. I always thought that Berlin had the World's first rescue pumpers, with their prototype introduced in 1983. Very interesting to learn that in some respects Plymouth was ahead of the curve! Added by Rob Johnson on 21 November 2018.